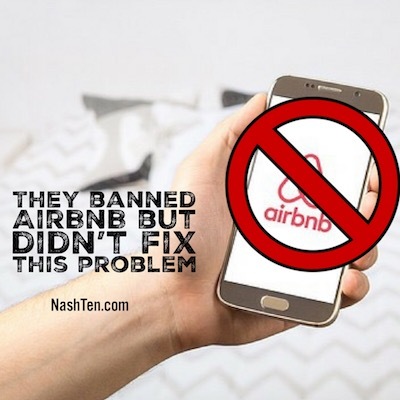 Nashville’s Metro Council voted last night to ban non-owner occupied short-term rental properties [like AirBnB] in residential areas. And the people who supported this bill believe it is a compromise because it gives the owners three years to convert their property to another use. While the supporters are championing this move by the council, I think the party won’t last long because they did not address the major concern of the residents of Nashville. There is still very little enforcement of the rules by any department of the Metro Nashville Government. Which means there is nothing to stop the things that neighbors have been citing as their reason for supporting the ban. Even the police chief came out earlier this week and said it was not his department's role to enforce the rules on the books. How will Metro enforce this new rule, when they couldn’t effectively enforce the old ones? Do they think the cheaters will just go away because another law was passed? I place a huge chunk of the blame for the problem on Metro Nashville. By not requiring people to follow the rules, they encouraged people to bend them. And instead of solving the problem, they focused on banning everyone. Last year, the Tennessee House got wind of what Nashville was trying to do and they passed their own bill which preempts the law Nashville just passed. The Tennessee Senate held off on voting until Metro’s Ad Hoc committee finished its work on a compromise bill. I expect the Tennessee Senate to pass a bill this year that puts us back to square one. And we still have an ineffective program to make sure everyone is following the rules. If it seems to you like a colossal waste of time and money, then I’d say that you are right. Here’s my advice to Mayor Barry, the Metro Council and anyone else who will listen. Make people follow the rules or take away their ability to rent the property. Hit reply and let me know your thoughts. The Daily Deal in Nashville is this renovated, three bedroom cottage in East Nashville that is close to downtown and listed for less than $375,000.